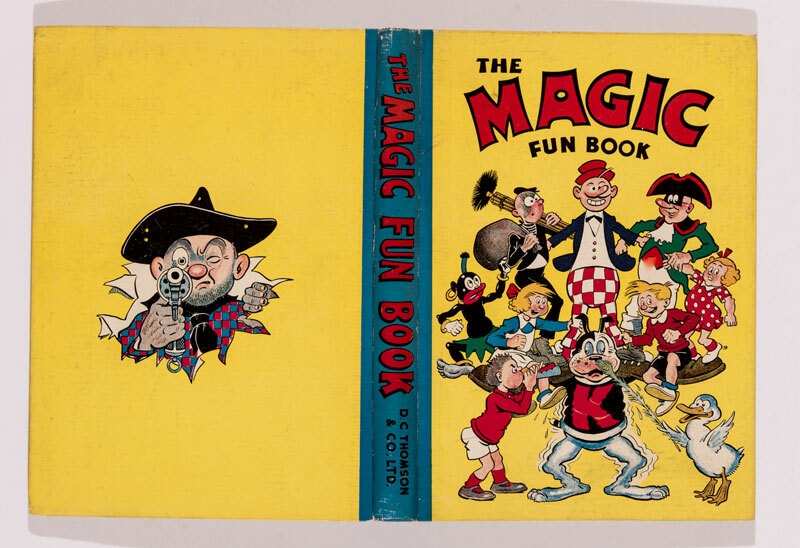 Another beautiful high grade key from the Brenda Butler collection hit the heights with a £2150 successfully bid for the Magic-Fun Book 2, the second of only two issues for this title. 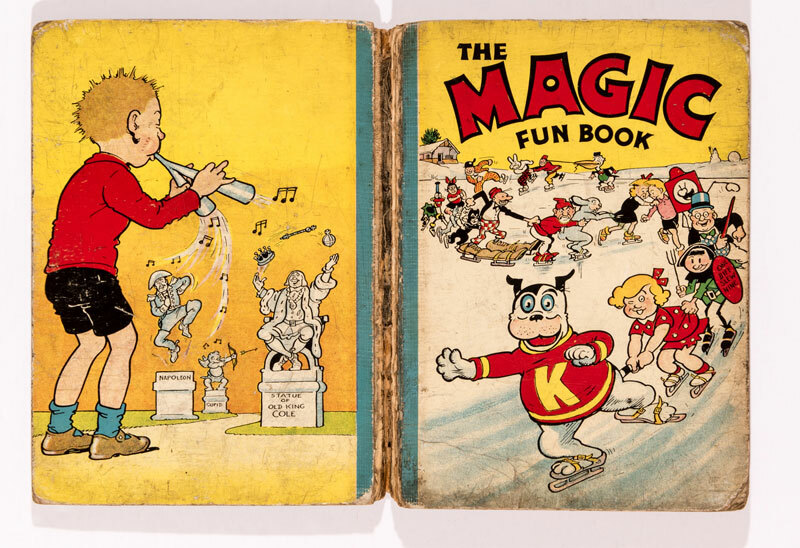 Here’s the No 1 Magic-Fun Book which heralded Peter The Piper by Dudley Watkins. Without spine and ‘well loved’ it fetched £175. 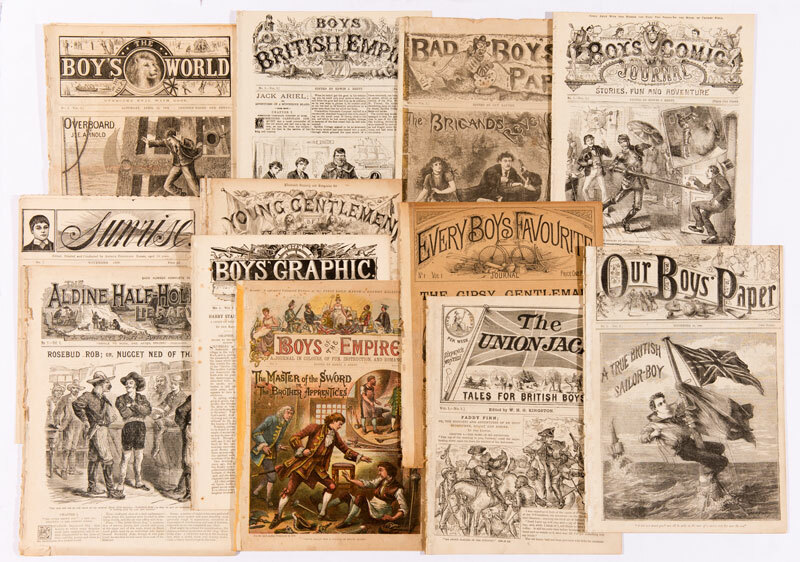 12 first issue boys’ papers from the 1800s made over £20 each. They were from the Bob Monkhouse Archive. 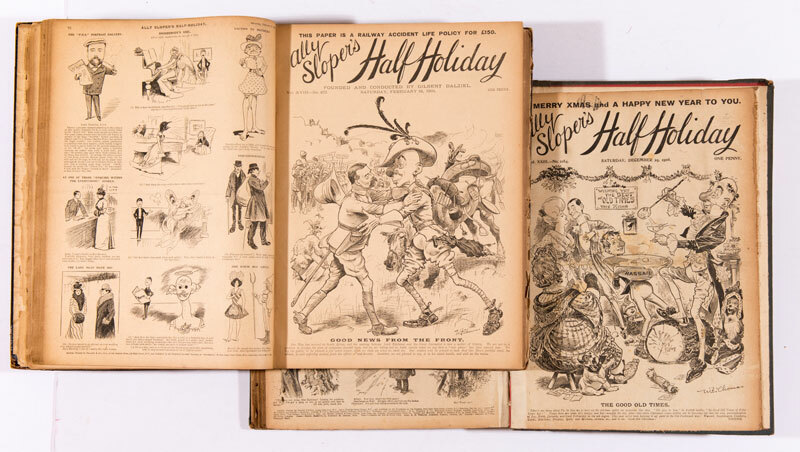 We are getting stronger interest in turn of the century Ally Sloper bound volumes and 127 low grade issues from 1901, 1905 and 1906 had satirical Boer War interest, selling for £330 to the USA. Propaganda war years Beanos continue to command high prices. 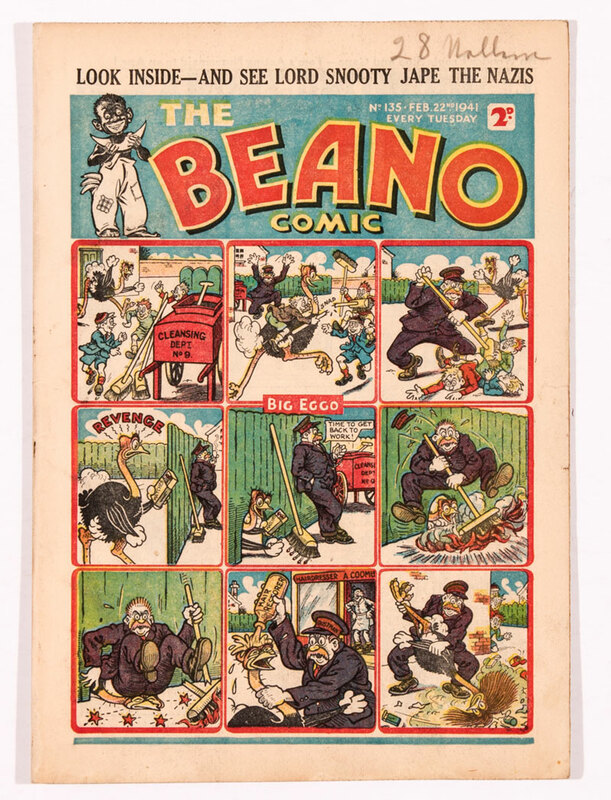 No 135 with cover strapline ‘See Lord Snooty Jape the Nazis’ and Hitler sending Pansy Potter an Easter Egg left impressionable 12 year olds in no doubt as to who our enemies were (naturally, the Easter egg exploded – harmlessly). £250 a pop. 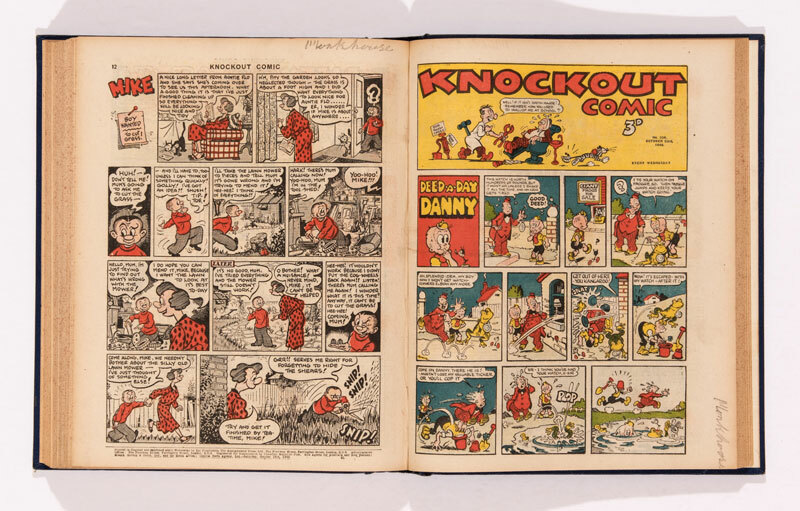 Knockout bound volumes for 1947 and 1949 collected £580 apiece. Strong prices that were enhanced by The Bob Monkhouse Archive from which they came. 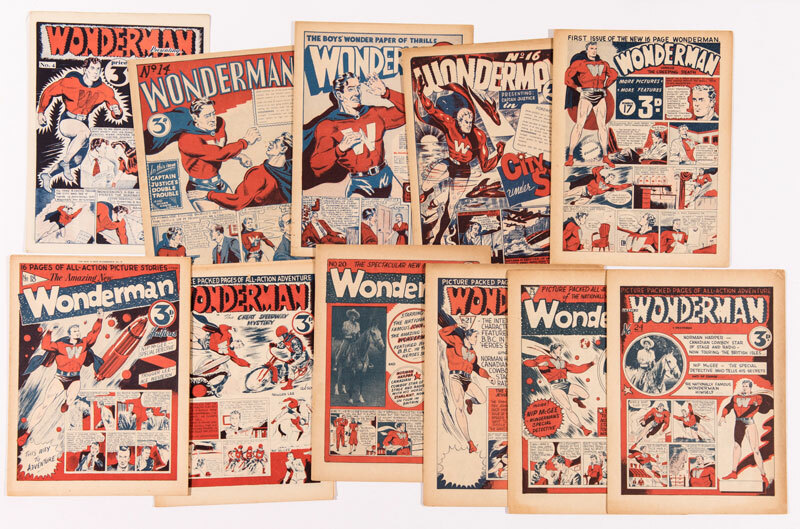 Another rare title from Bob Monkhouse is Paget publication’s Wonderman, Mick Anglo’s first super-hero character. 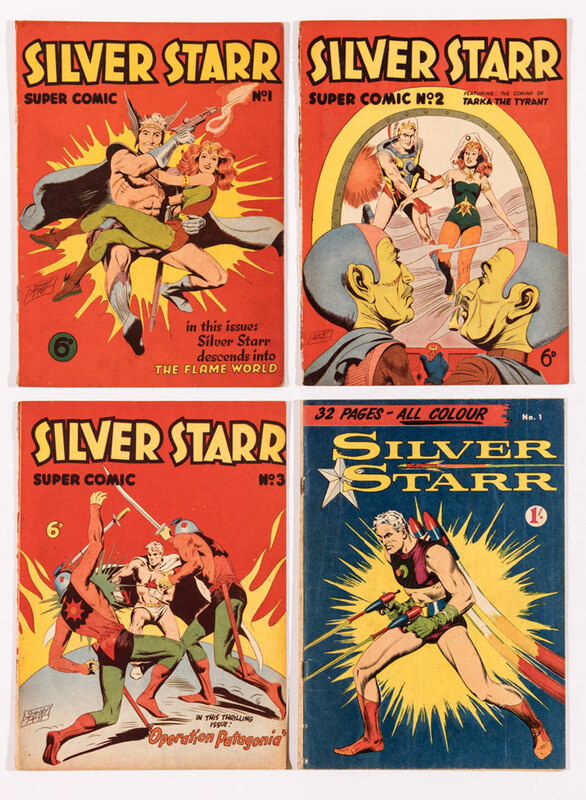 Whilst No 4 comes up more regularly, the other issues are genuinely rare and £370 took away the eleven issues. 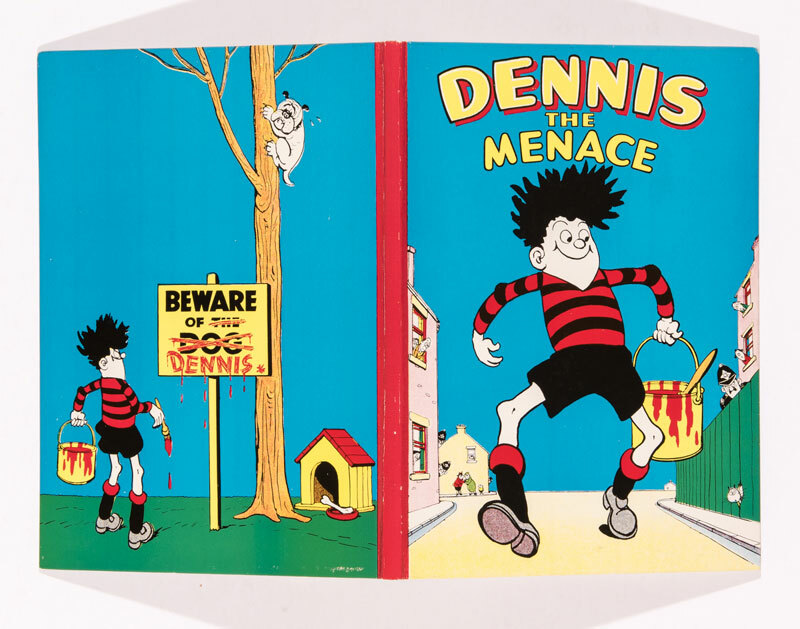 The Brenda Butler Archive triumphed once more with a record price for the first Dennis The Menace book from 1956. In [vfn] grade it took £360. 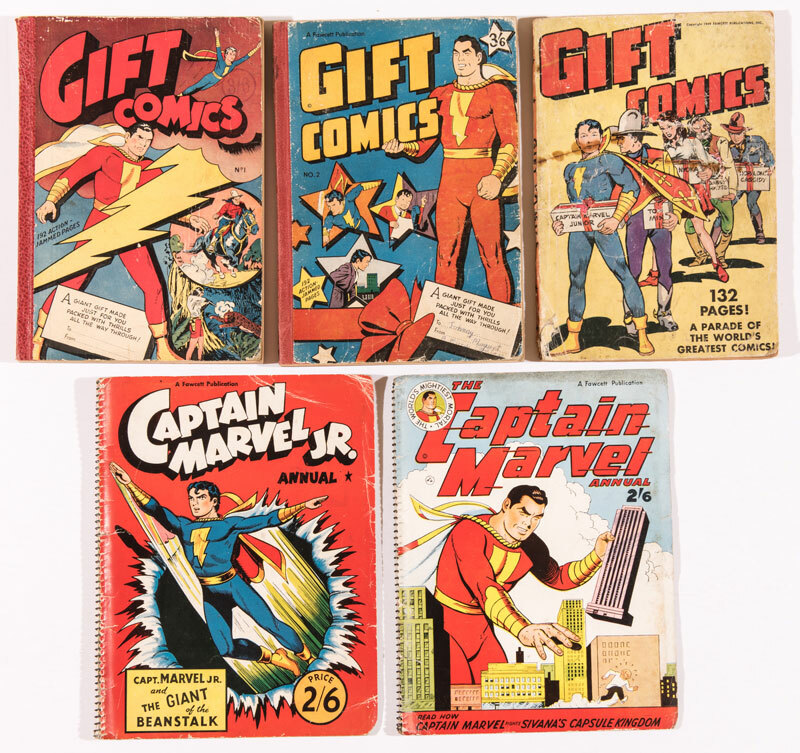 Gift Comics were compilations of Captain Marvel, Bulletman, Ibis the Invincible and Spy Smasher, largely produced to sell unsold overs in a bulk format. As such they were produced in erratic print runs and are much collected today. 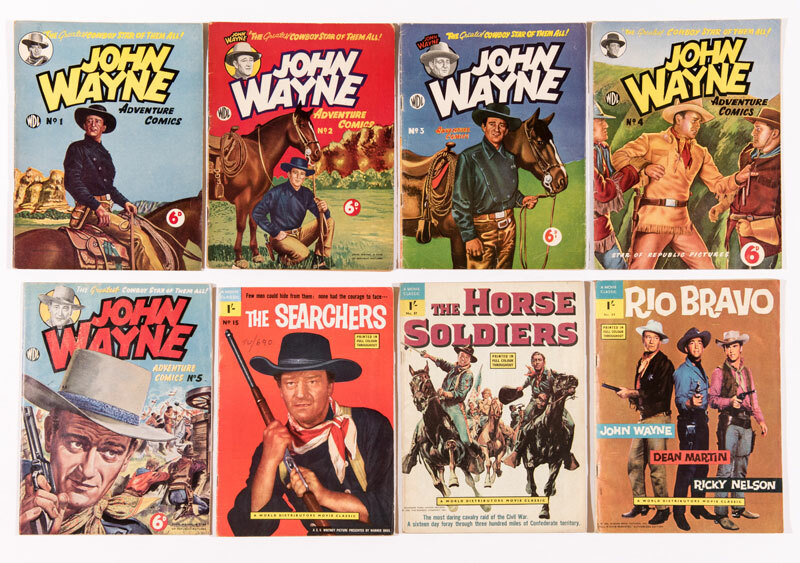 Along with two L Miller UK reprints and 2 Cap Marvel/Jr. annuals they sold for £240. Shazam. 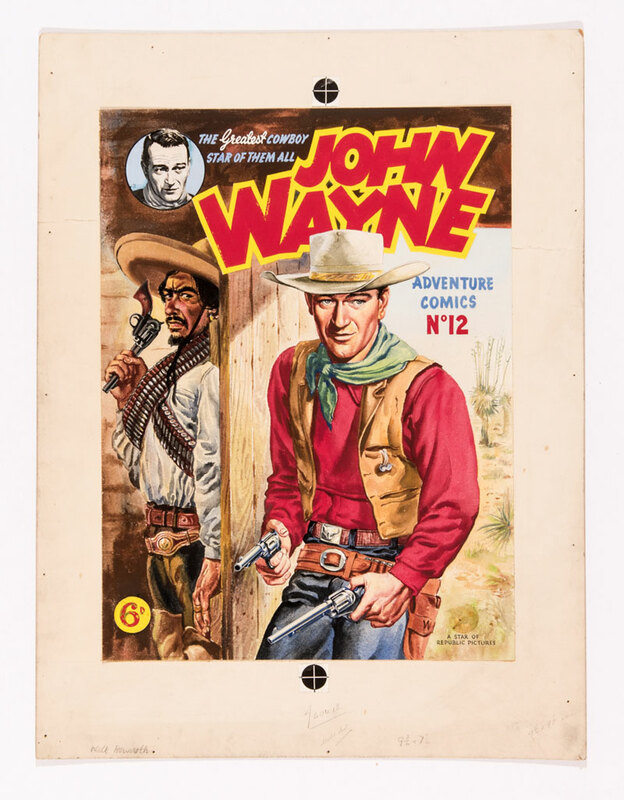 A scarce original artwork of John Wayne Adventure comics No 12, drawn, painted and initialled by Howarth exceeded its estimate at £310. I think the Mexican bandito should cheer up a bit. 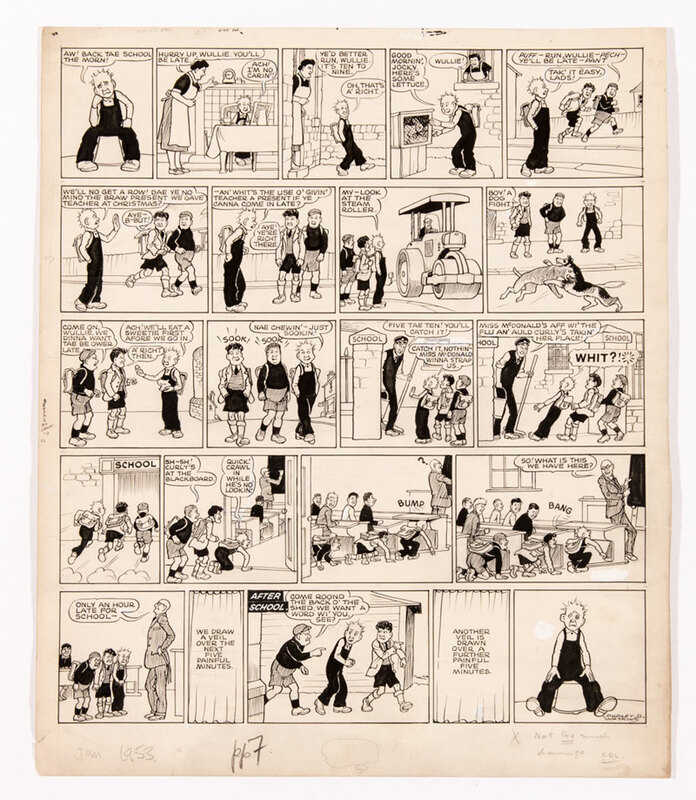 This Oor Wullie original artwork saw him reading the Dandy and getting late to school but auld Curly was waitin’ wi’ the strap, and he got into a fight as weel. Plenty of action for the Wee Lad and in the auction brought £470. Jings! 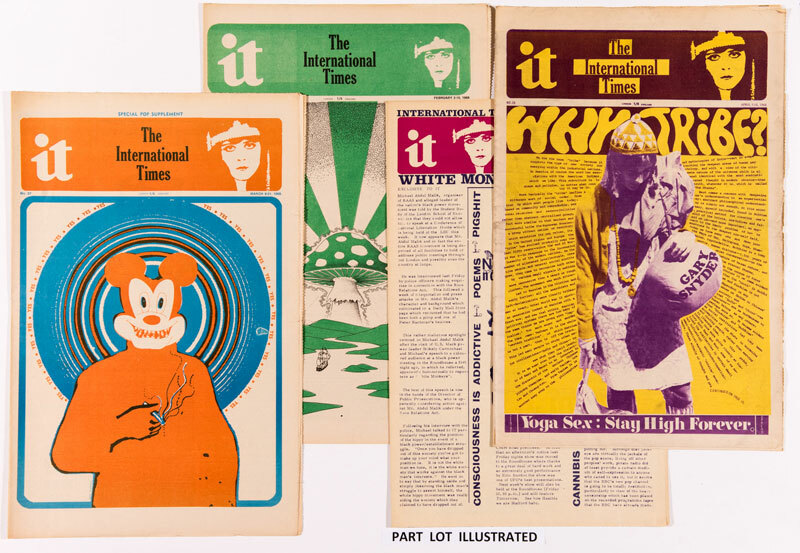 International Times recorded the hippy, alternative life-style, drug enhanced, music filled 1960s and is collected today for the subversive views that it promoted in those heady days. 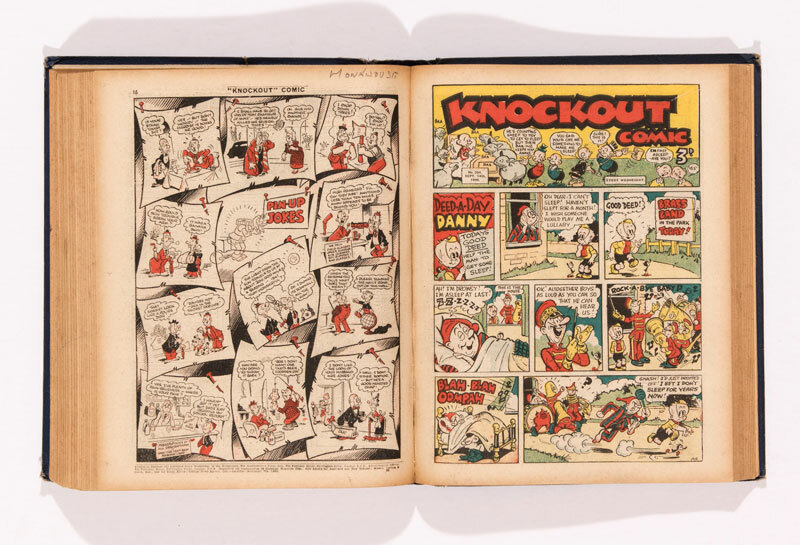 14 issues in fresh, unfolded condition commanded £420, man. 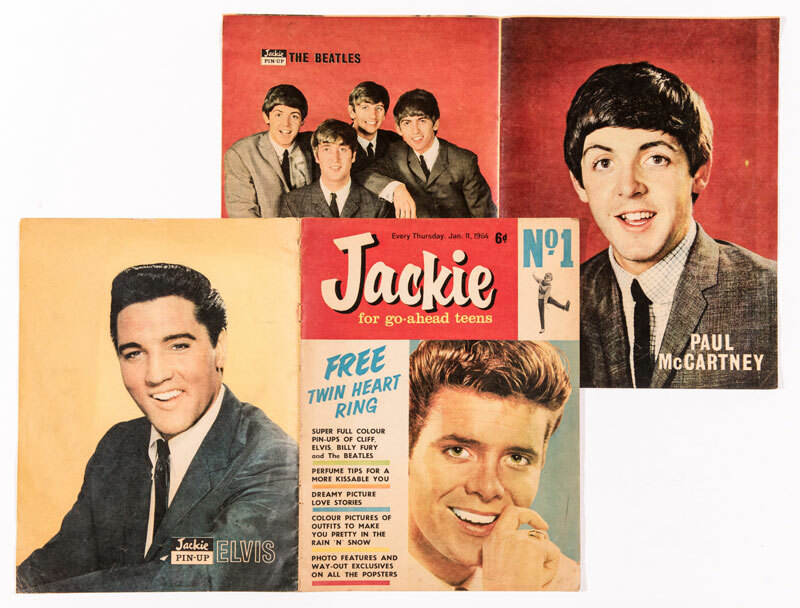 At the opposite end of the spectrum, Jackie magazine No 1 complete with Beatles centrefold collected £100. 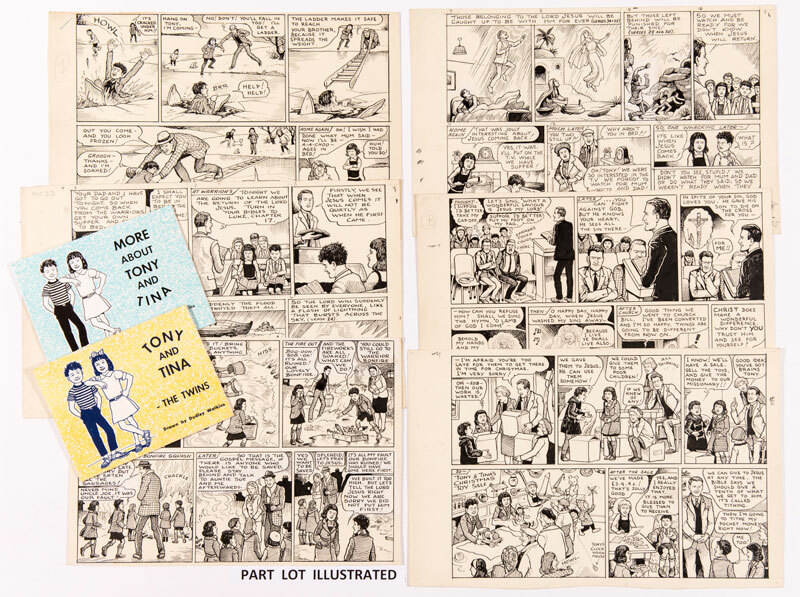 The More About Tony and Tina run of 32 page original artworks by Dudley Watkins were rewarded with £740 for these religion-based stories. 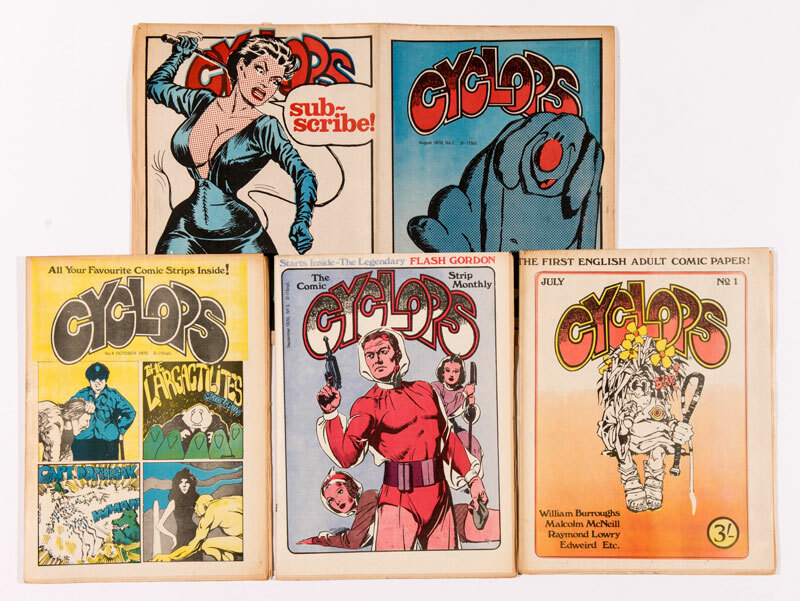 The Cyclops title from 1970 was an attempt by the publishers to replicate the success of International Times. 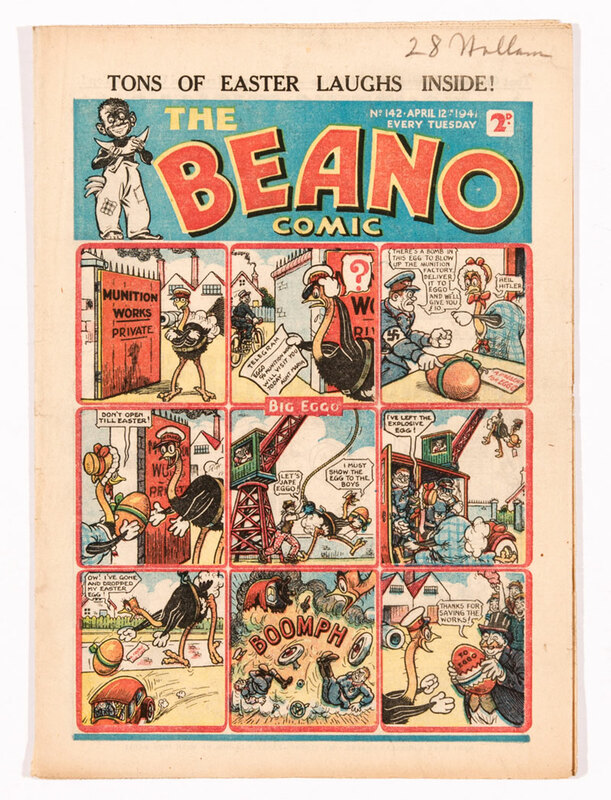 It failed with just four issues being printed and this scarce run was taken to £180. 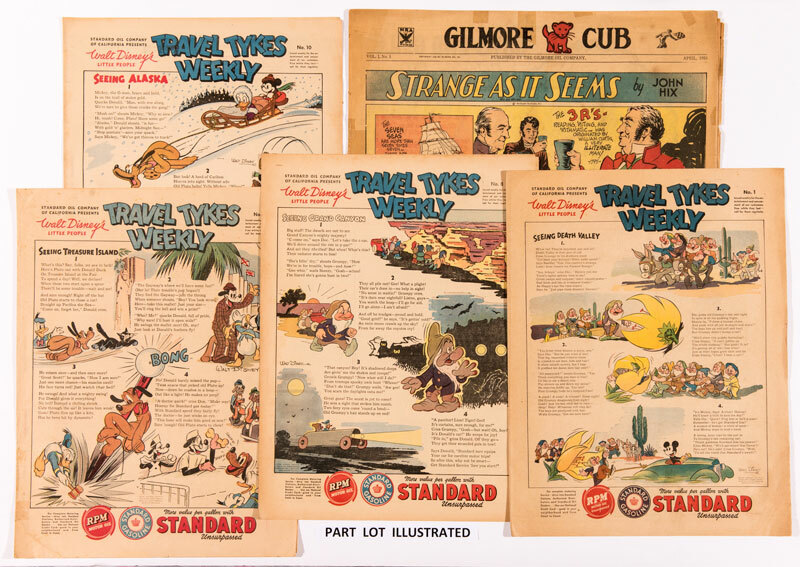 Our US section started off with Travel Tykes Weekly, a promotional comic given away at Standard Oil gas stations which starred Mickey Mouse and the Disney gang. 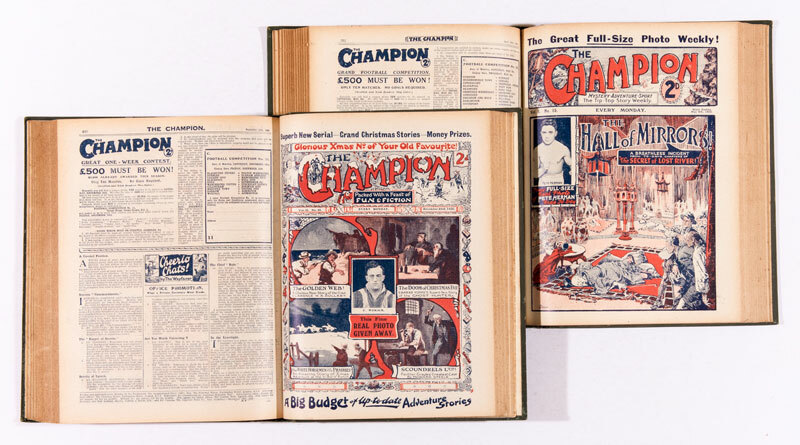 Not listed in the Overstreet Price Guide, eight copies including No 1 went for £105. 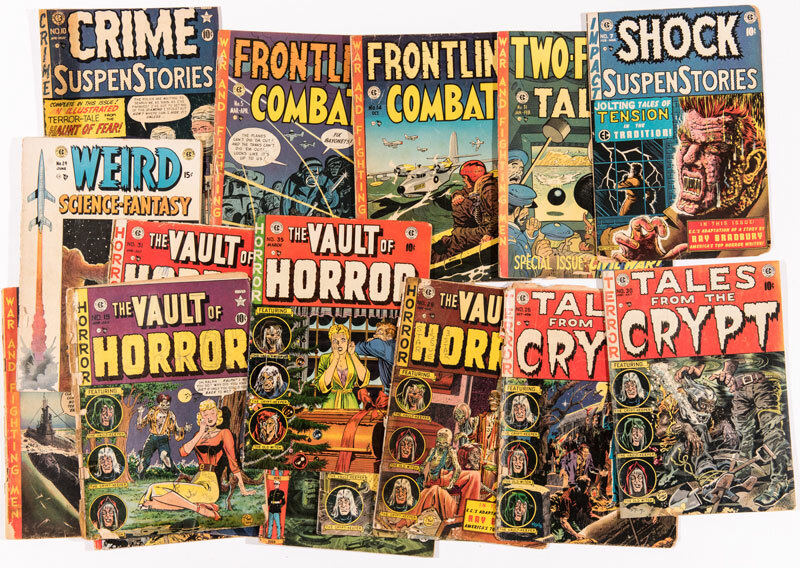 Crime SuspenStories, Haunt Of Fear and Tales from the Crypt had badly worn spines, a few [gd] the balance mostly [fr], but they still sold for £9 each. 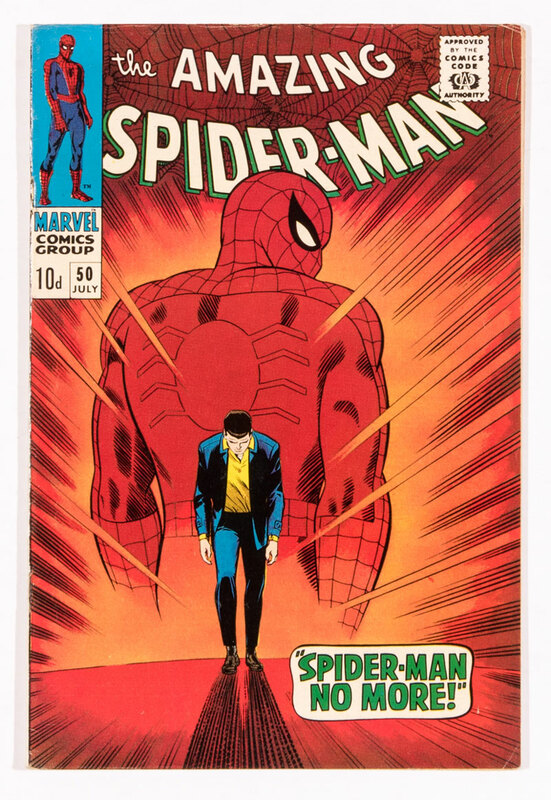 Amazing Spider-Man 50 with classic ‘Spidey No More’ cover created an above estimate £180 in Very Fine grade. 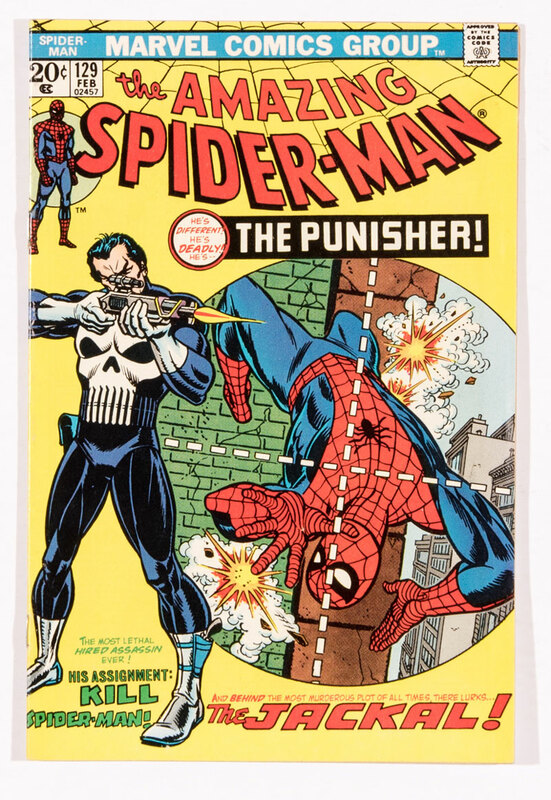 The first Punisher appearance attracts a premium price but this cents copy had moisture ripple to its top cover whilst still making £330. 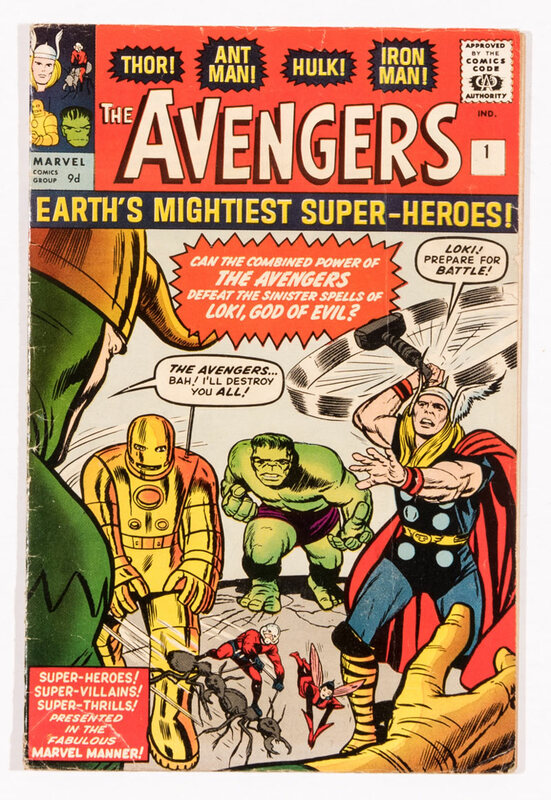 Avengers 1 is a key Marvel book and some wear was evident in this [vg] copy which was hotly contested to £900. 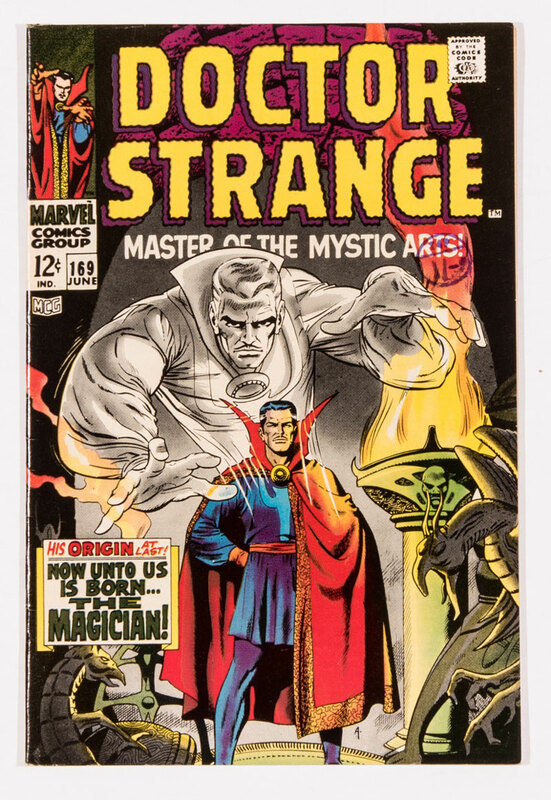 The Doctor Strange movie has just come out with Benedict Cumberbatch and Tilda Swinton so £145 spirited away this hot book. 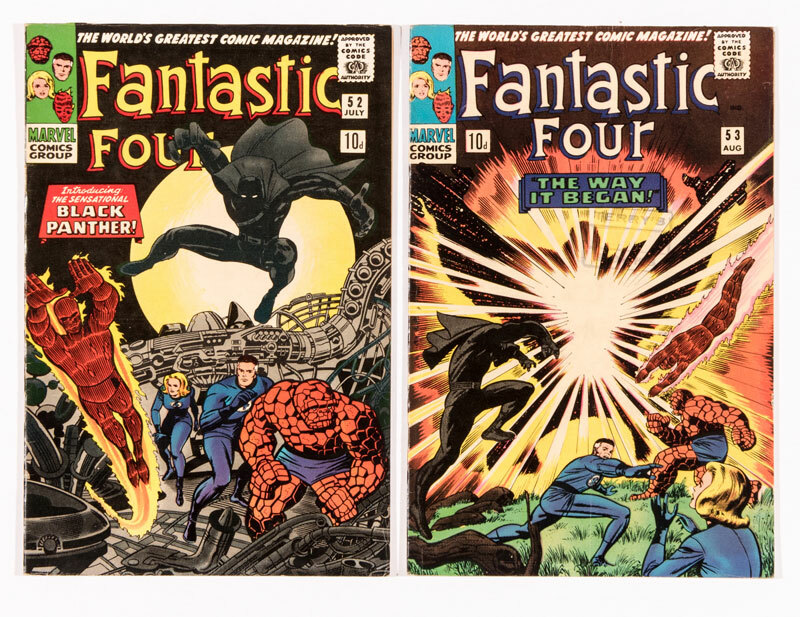 Fantastic Four 52 and 53 heralded the first appearances of Black Panther, tamed by a winning bid of £230. 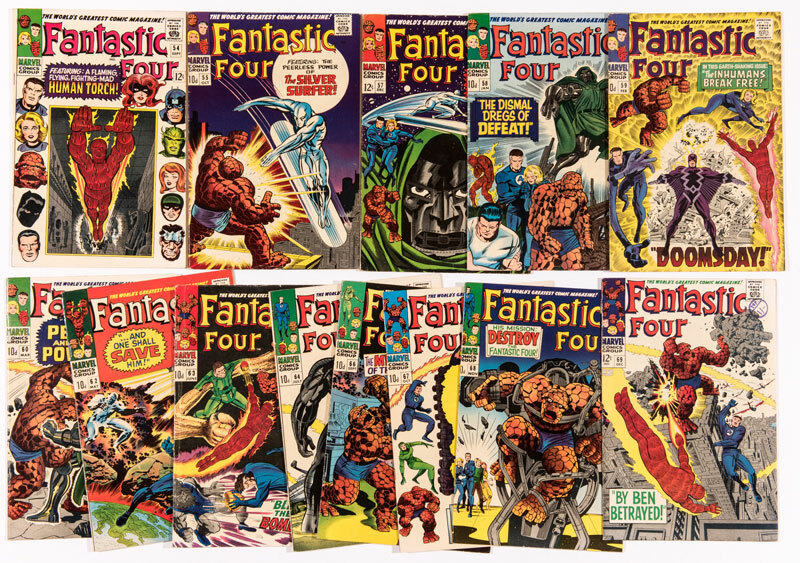 A further 13 copies of FF between 54…69 swallowed up £330. They were all cents copies in [fn-vfn+] grades. 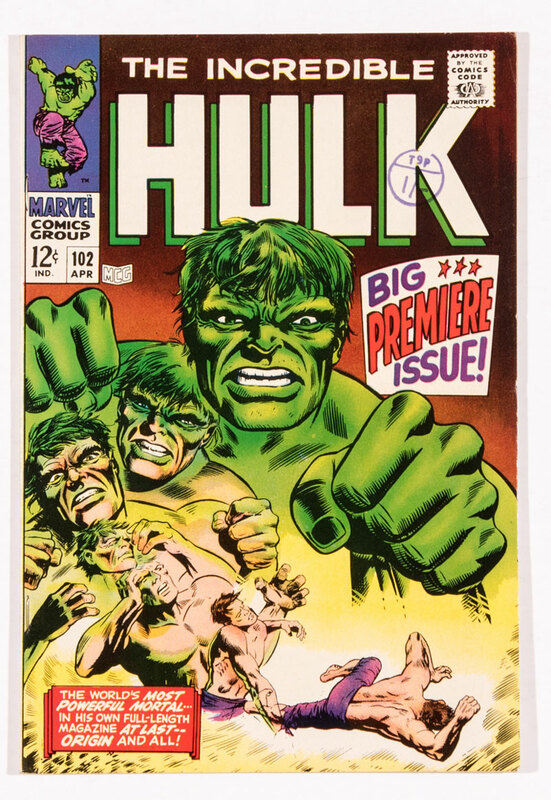 Here’s Hulk 102 in Very Fine to Near Mint grade which sold for £155. 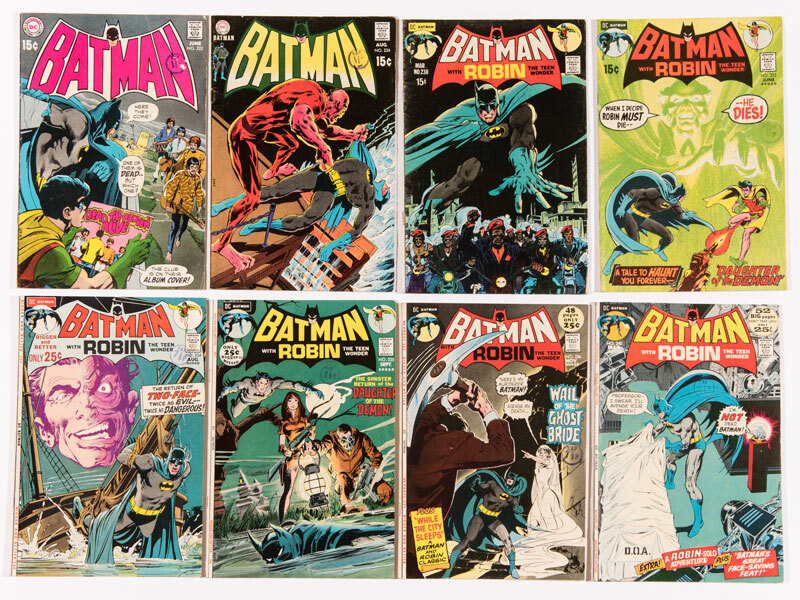 Beatles take-off in 222, hot 232 and Neil Adams issues created a £300 Batman bonanza for these eight books. Last time I told you about the impending wedding of my girl-friend’s daughter, Emma in August 2017. Well, the dress has been chosen and fitted, (luckily water-proof to the torrent of tears that washed over it). The venue organised, the tasting menu tasted (my call for seconds rebuffed), the flowers arranged and the gentlemen involved required to wear blue suits. When I gently suggested that Superman’s suit was mainly blue I was firmly informed that cosplay would have noplay in the proceedings. Rats.